You can’t stop the summer heat from arriving. However, with a central air conditioner from Swanton, you can prevent those hot, high temperatures from landing in your home. Will Your Comfort Sink or Swim? If you find the summer heat is making itself at home in your space, try not to get too hot under the collar. Our central air conditioners have the power to make the sweltering temperatures fly the coop. Plus, with up to 20-plus SEER, they’re highly efficient, too. Are you ready to spread your wings and soar toward the chilled relief you deserve? Your unit is over 10 years old. It consistently fails to keep your nest cool. It requires frequent system repairs. While operating, your unit generates loud noises or foul odors. There are inconsistent temperatures throughout your home. When it’s time for takeoff, our professionals will use their broad wingspan of AC expertise to guide you toward the perfect unit for your home. This is a cooling system that’s powerful enough to keep your entire home cool without overworking or short cycling. It’s also the right size to fit the bill for your home’s layout. Once the right cooling system is on your radar, our team will swoop in to install it flawlessly. With the right cooling system and our professionals as your wingmen, it’s a guarantee that you’ll find yourself perched on a higher branch of comfort. Beat the heat with the team you can count on to “tweet” you right—and that’s Swanton. So, nestle up to a cooler home by filling out our online form or calling us at 732-335-6731 today! Carrier’s Infinity® Series air conditioners have an air of superiority to them—and rightfully so. With an enviable SEER rating of up to 21, models in this series are built to deliver total home comfort in the quietest, most efficient manner. 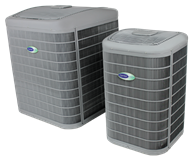 Plus, when combined with the innovative Infinity® control, no other air conditioner can reach the caliber of comfort management these units deliver. No matter how much space you have, Carrier’s Performance™ Series air conditioners will keep your home cool in a reliable and energy-efficient manner. But, on top of its impressive SEER rating, this series offers a compact unit for tighter installations, too. With one of these units, space restrictions aren’t a problem. Dependable chilled relief is one reason to consider a Comfort™ Series air conditioner, but it’s not the only reason. With impressive SEER efficiency ratings ranging up to 16, these units are the most economical way to attain a reliable and efficient cooling system. Simply put, it’s cooler to cut your utility bills with a Comfort™ Series air conditioner. Want to Feel as Free as a Bird? With our maintenance plans, it’s always a smooth flight toward total comfort and peace of mind.